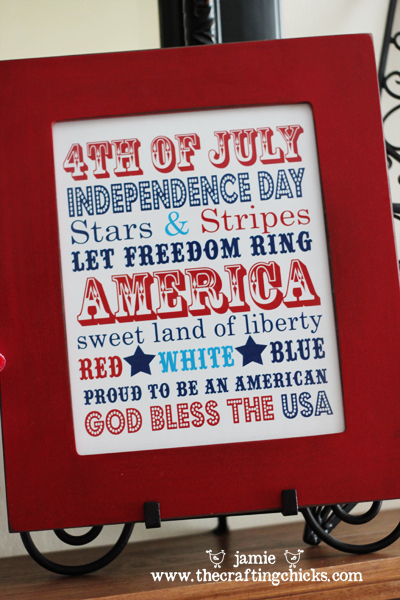 Independence Day is next week, and it's time for sharing some of my favorite Pinterest 4th of July projects. 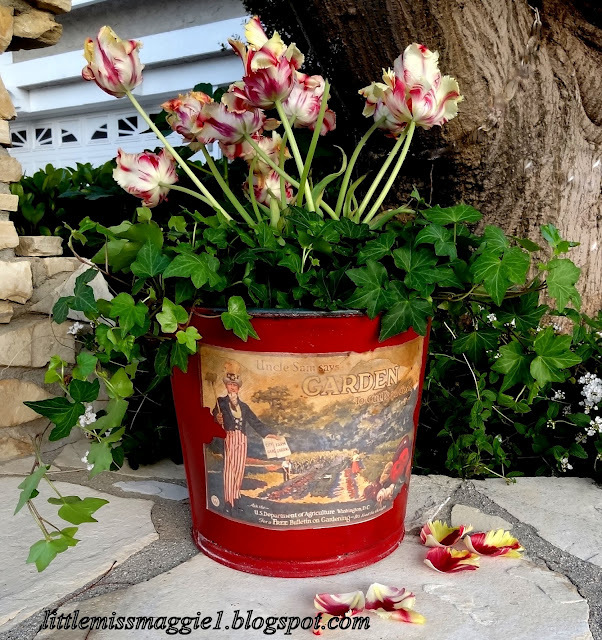 Maggie of Little Miss Maggie decorated this cute Liberty Garden Bucket and offers a tutorial and the free artwork for download. 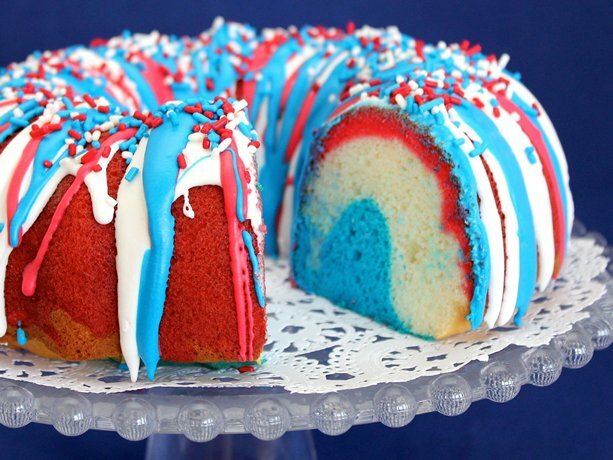 This Firecracker Red, White, and Blue cake is from an easy Betty Crocker cake mix. 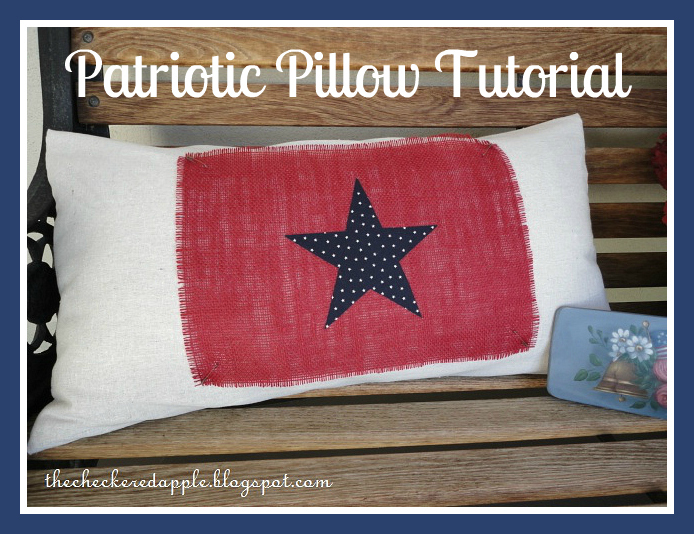 Laura painted this Stars and Stripes pillow and shares the how-to at Top This Top That. 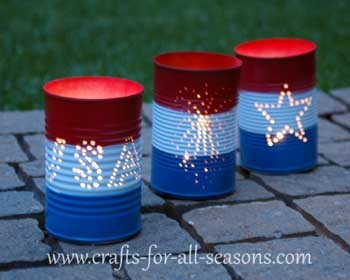 For these Tin Can Luminary tutorials, visit Karen at Crafts for all Seasons. 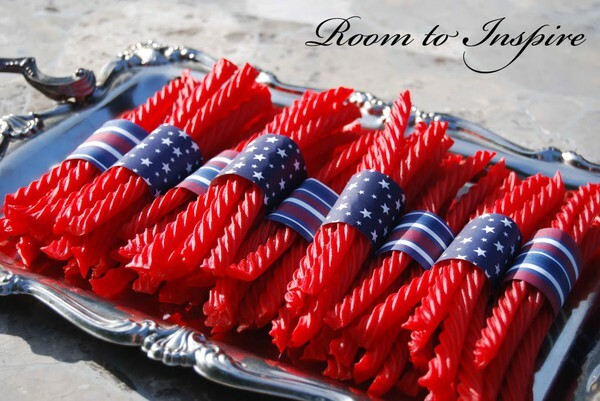 Room to Inspire used red, white, and blue scrapbook paper to bundle Red Vines for all. Deb at Lake Girl Paints painted these Summer Beach Chair stars. At Heat Oven to 350 Trisha and Nicole share these Cheesecake Cookies that I think would be a big red, white, and blue hit this 4th of July. 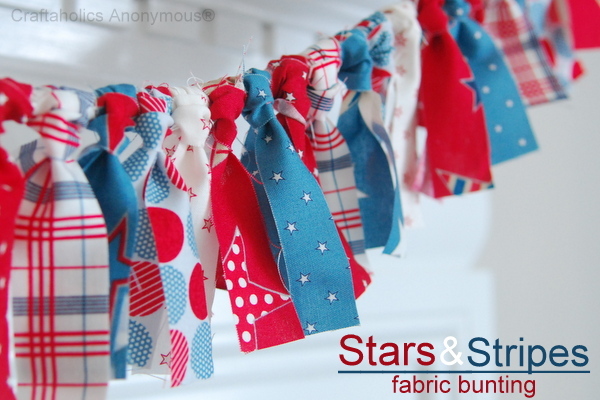 Linda's tutorial for this Patriotic Fabric Bunting is at Craftaholics Anonymous. I had to search high and low to find the origin of this cute mason jar bouquet. I finally found it at Steadmans' Corner, where it was created by Sandie. 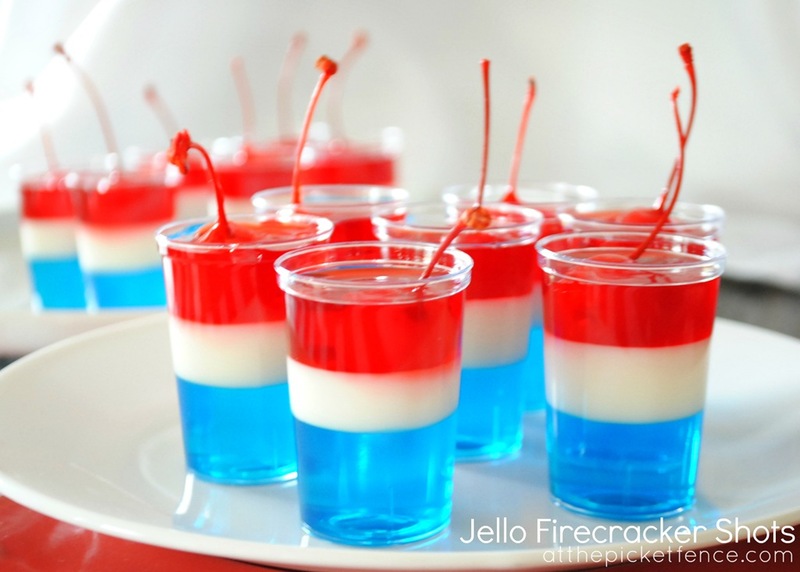 Venessa and Heather share these 4th of July Jello Firecracker Shots in two versions: adults and kids. 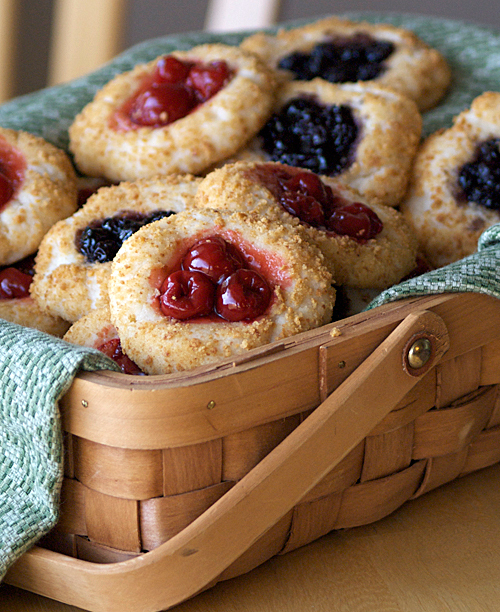 Find the recipes at At the Picket Fence. 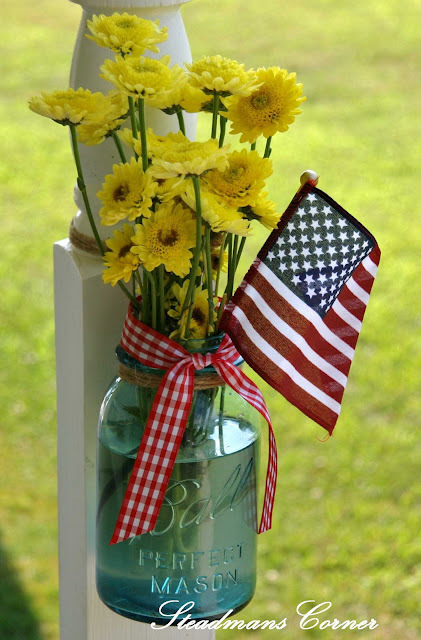 Diane from The Checkered Apple is my favorite 4th of July inspiration and the hostess of The Patriotic Link Party where I'll be linking up my own 4th of July projects later this week. Make sure you don't miss the Patriotic Link Party for tons of inspiration and ideas and to link up your own great projects. Find the tutorial for this cute patriotic pillow cover, just one of many of Diane's own fun Independence Day projects, here at The Checkered Apple. 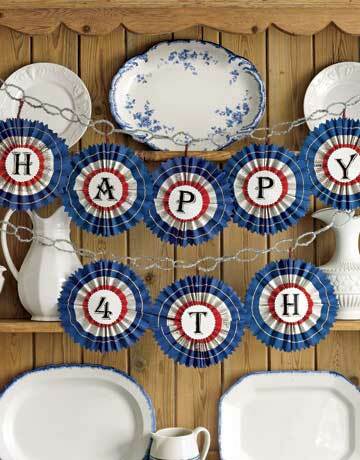 Country Living has instructions for this DIY red, white, and blue Rosette Banner. 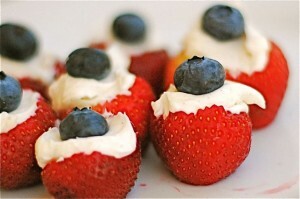 The recipe for these Red, White, and Blue Stuffed Strawberries was posted on Babble by The Naptime Chef. This word art was created by Jamie of The Crafting Chicks. Visit them for the free printable download. 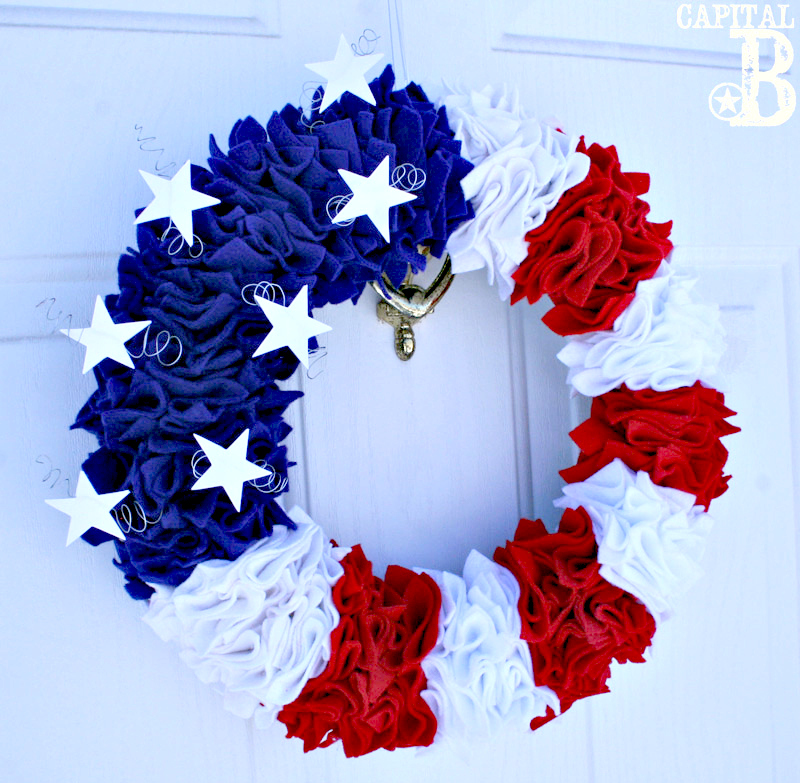 Sky at Capital B has been pleasantly surprised by all the Pinterest visitors she's had for this beautiful felt 4th of July wreath. And there you have them, many of my favorites from Pinterest. I hope you've found something to inspire you, too. and please feel free to grab my button from the side bar. Great photos. I es[ecially love the first one with the flowers. Laurel, you really picked a lot of great posts for inspiring everyone! I know there are so many creative people out there and I just love seeing what everyone comes up with. 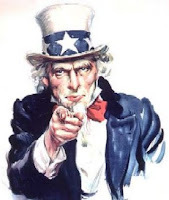 Thanks for adding my patriotic pillow to the list! Great patriotic inspiration. Can't believe Independence Day is just around the corner. Thanks, Laurel! I love this time of year. Thanks so much for featuring me and hosting the party. Thanks for all the Fourth of July inspiration! What fun! I really like Laura's pillow and that amazing wreath! Those are all great projects. Thanks for sharing them.